I’ve been a big fan of all types of needlework. I love to do needlepoint, embroidery and cross-stitch. When I learn there was a class on Swedish weaving in Rimouski, I jumped at the chance of learning a new type of needlework. I recently discovered Huck toweling. I’m having a blast!! So much so that I’ve decided to carry the product in the store. I even done my first creation in Huck toweling. The free pattern will be available soon. There is now a new section in the store. You’ll find all you need to complete beautiful projects. Come back often as I’ll be adding patterns and products. You will also find on this page links for free patterns. The pink and blue towel design is offer here free of charge. Swedish weaving is a type of surface embroidery in which a decorative thread. The design doesn’t go through the fabric but run under some of the threads. 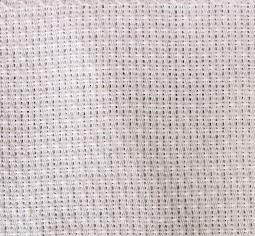 It is also called huck weaving after the fabric, huck toweling, on which it was first widely used. It was especially popular in the US in the 1930’s into the 1940’s and was used to decorate tea towels and aprons, Swedish weave became popular again around the 60’s. This technique requires fabric that has a set of threads made of horizontal and vertical floats. The weaving is done through the vertical floats. 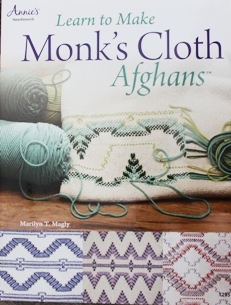 Two popular types of fabrics are monk’s cloth and Huck toweling. 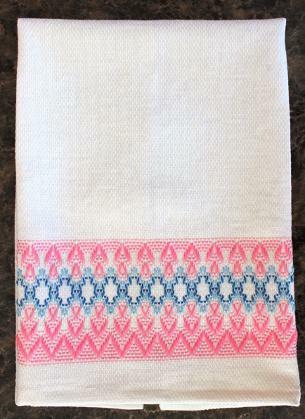 Huck toweling is a dishtowel type, 100% cotton fabric,. It is perfect for dish towels and it is lint free. This fabric is approximately 15’’ wide. This will be the type of fabric to use with the free patterns you’ll find here. You can use embroidery floss to do the stitching, or any type of thread that is washable and about the same size as the floss. 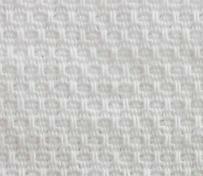 You can also use mercerized cotton, such as the one use to crochet doilies. You will also need a #24 tapestry needle. First, you need to prepare the fabric. You will need 27’’ of fabric for a 24’’ towel. 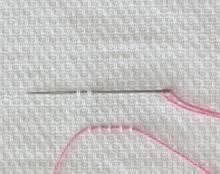 Stitch each end with a zigzag to prevent fraying of the edges. Wash and dry the fabric to let it shrink before stitching your towel. Press the fabric flat. You’ll probably need to use steam. Any dark colored floss used for the design should be washed as it may bleed. Start your stitching 3’’ from the edge, finding your center vertical float. Stitching begins from the center towards each edge. Start your first row by pulling the thread through the center float until you have an even length of thread on each side of the float. Leisure Arts has a great designs book for Huck toweling with complete instructions. 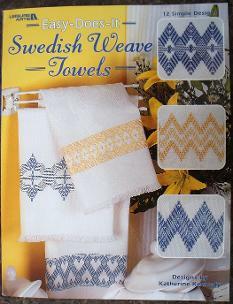 Look for Easy-Does-it Swedish Weave Towels in our store. A few books that has great patterns.